Che festa! 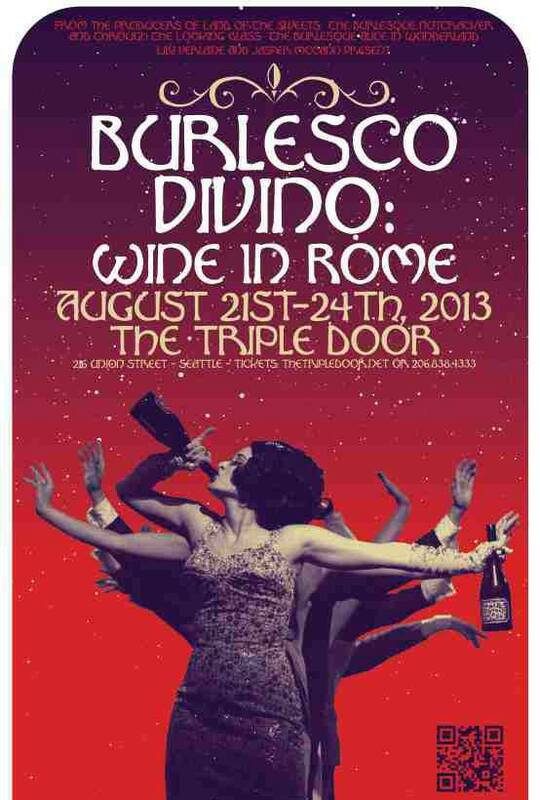 (Anno due) Burlesco DiVino returns to The Triple Door. Many grand ideas have been born over a glass of wine. 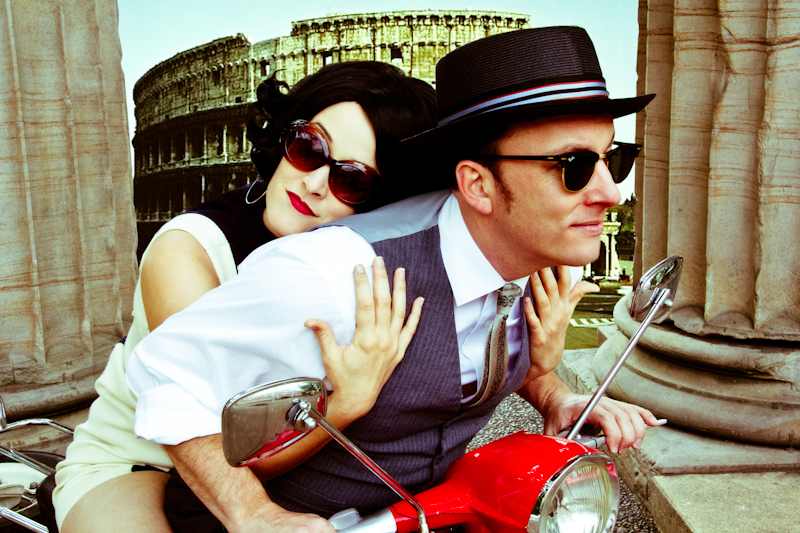 In the case of Burlesco DiVino: Wine in Rome, it was the nationwide Month of Riesling celebration that led to a brand new work from producers Lily Verlaine and Jasper McCann. The Triple Door commissioned the production in 2012 to coincide with the summer’s wine emphasis; in the capable hands of Verlaine/McCann, a theatrical burlesque show became a wine-soaked soiree moving through time in two acts. The first is a sort of dramatic pantomime set in ancient Rome, where a bountiful harvest culminates in an orgiastic party at the Temple of Bacchus as fire dancers and priestesses conjure up the God of Wine. The second act hinges on a plucky American reporter waking from a night of Roman debauchery in the Swinging Sixties. Driven by ambition, she plans to sneak into an exclusive party with the crème de la crème of Rome’s fashion set to snap a photo of reclusive Italian socialite Donatella Bianchi. “We basically wrote two shows. It’s like a double feature,” Lily explained after a recent all-day rehearsal. “When our cast is asked in interviews ‘What’s your favorite Verlaine/McCann production to be in?’ hands down, everyone says Burlesco DiVino,” Lily said, which the producers attest to the mash-up of dance styles the show calls for. Combined with a story bridging different time periods, the ensemble-heavy show effectively plays to the strengths of the multifaceted cast. Burlesco also highlights several notable principals in solos as well as many rising stars. There’s TriBellas’ highly skilled belly dance, Inga Ingénue’s deliciously intricate solo as model Benedetta Barbieri (flanked by Untamed Felines), and – one of Lily and Jasper’s favorites- Paris Original’s Pas de trios. Intimate, delicate, and gender-reversed- the dance culminates with Paris’ toes exquisitely pointed as he turns in the hands of his female partners. In light of Lily and Jasper’s other major works (the hugely successful Land of the Sweets and Through the Looking Glass), Burlesco is both divergent and a natural progression. The pair’s accomplished writing, directing, and choreography are increasingly in the foreground whereas in the past, “Lily Verlaine, burlesque dancer” and “Jasper McCann, emcee” were the most common associations. These days the pair is more interested in fostering the talent of newer stars and rising ones whose potential is just being tapped, both on stage and in essential functions behind the curtain. Burlesco, like all of the exquisite work we’ve come to expect from Lily and Jasper, is the intersection of theatrical burlesque and contemporary ballet underlined with clever eroticism. Two original songs are featured, written and arranged by Jasper and James Chapple. “Ricordare La Presente”, delivered mostly in Italian, embodies the show’s themes of living the present moment to the fullest, since the past is gone and the future may never come. A noble theme and certainly worth toasting. Isn’t this the cutest wine label imaginable? To that end, there’s a special wine release in the Triple Door’s Musicquarium Lounge on opening night. 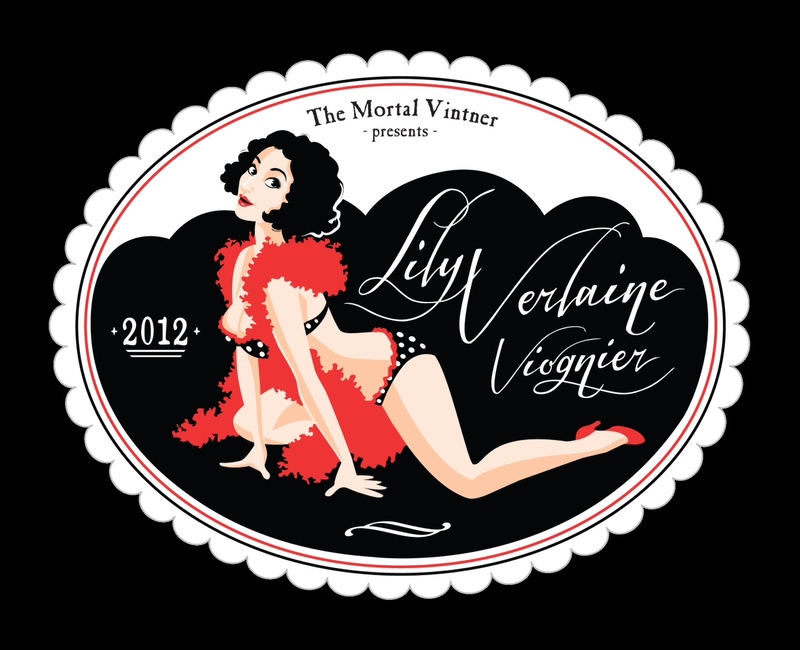 After seeing Burlesco DiVino last year in Walla Walla, The Mortal Vintner contacted Lily and asked if she’d like to be featured on a wine label. Her answer of course was an instant “YES”, and Lily Verlaine Viognier was born. The wine, made from highly aromatic white grapes, will be available in glass pours as well as in bottles for purchase after the show. Sampling a glass after rehearsal, Lily asked Jasper to describe it. “It has a lot of structure for a Viognier. Peach, tangerine, dill…excellent notes of white stone fruit. It’s very sharp, not too cloying…” he mused. Which sounds almost as luxurious and nuanced as a Lily Verlaine & Jasper McCann Presents production. Read more about the show at www.burlescodivino.com, and get tickets over HERE. ~ by angrytruffle on 08/17/2013.